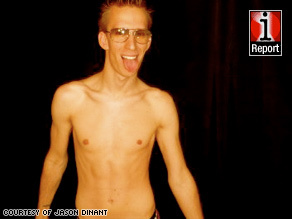 (CNN) -- Midway through Jason Dinant's fitness journey to get six-pack abs by June, the 27-year-old had a breakdown. Halfway through his fitness goal, Jason Dinant said he sees a four-pack gradually forming. After months of eschewing junk food in favor of lean protein -- egg whites, chicken breast and vegetables -- he devoured pie. The slice came from Marie Callender's, drizzled with caramel, loaded with candied apples and layered with cream cheese. "When I woke up the next day, I had a horrible stomach ache," Dinant said. "My trainer said once you're on the diet, you can try to go back and have a day where you binge on bad food and it's going to give you a stomach ache." Since January, CNNhealth has been following the progress of three iReport contributors as they strive to meet their New Year's diet and fitness goals. One of them is Dinant, a Las Vegas, Nevada resident, who wanted to get a six-pack by summer in time for his 10-year high school reunion. He also wants to show off a chiseled stomach on his blog called "Naked Boy News," where he stands shirtless to give "the naked truth about today's news." The junk food breakdown came after almost two months of staying on a lean diet. The self-described "candyaholic" often craved his favorite treats like York Peppermint patties, macaroons, Mounds bars and Coca Cola. "The key to falling off the wagon is not to stay off the wagon," said Gregg Avedon, a certified fitness trainer and model whose chiseled six-pack has appeared on the cover of Men's Health magazine 18 times. "If you fall off the wagon for one day, the problem is it could lead to two days, three days, a week, then you fall off completely. Next thing you know, it leads to two weeks of binge eating." Dinant has maintained his diet of 16 egg whites, one and a quarter-pound of meat, four cups of vegetables, potatoes and rice a day. He treats himself to one Tootsie Roll a day, and sometimes indulges in gelato. Dinant's quest for six-pack abs -- which initially included 500 daily crunches -- brought attention from his neighbors, an egg company that ships him 15 dozen eggs every two weeks and news media such as USA Today and his hometown newspaper, Las Vegas Review-Journal and blogs. Some people left words of encouragement for Dinant's quest for tight abs, but others were less supportive. A picture compared him to a toothpick. Another one showed a kitten shooting a shirtless Dinant. "A lot of people said, 'You need to put on a shirt,'" he said, so Dinant set up a Web site called putonashirt.com where he compiled the comments. The hate mail comes "when they see a thin guy trying to be more fit. They're jealous," Dinant said. The negative comments add fuel to his fire. Dinant doesn't have a six-pack yet. "You can see four," he said. "It's more defined. The middle two are coming in. I need a tan. I'm so white it's hard to see." In January, Dinant's exercise regimen started with 500 stomach crunches a day, after hearing a Britney Spears interview about her sit-ups for toned abs. Dinant has abandoned the crunches and enlisted a personal trainer who has designed 11 core body exercises. For 20 minutes, Dinant performs 25 repetitions of the exercises, which include a floor bicycle, upward leg lifts and a type of sit-up where he lifts his legs and arms up at the same time. He spends an hour jogging, doing cardio and lifting weights. He also changes his exercise routines and works out four to five times a week. Recently, Dinant lost his job in sales for a Las Vegas show, which he attributes to a sluggish economy. He still has his job as an emcee for a night club and on the bright side, he said he "can dedicate more time to work out." "I'm working out my legs and arms to burn the calories, to lose the layer of fat," he said. "I don't want to plateau and have a two-pack." Many fitness fanatics do the same exercises and never see improvements because they plateau, said Avedon, a trainer in Sunrise, Florida. "In the gym, you need to change the factors of what you're doing," he said. "If you're doing heavy weights and lower reps, you can change to more moderate weights and moderate repetitions. You can change exercises, do different types of cardio. It's creating change. The body adapts to change quickly and responds really well when you hit a plateau." At the same time, some people have difficulty getting a six pack, because of elevated levels of cortisol which can lead to belly fat, said Avedon, author of "Muscle Chow: More Than 150 Meals to Feed Your Muscles and Fuel Your Workouts." "You've got to make sure the cortisol level is not elevated," he said. "One way is proper sleep and reducing stress." Before blaming hormones for flab, Avedon warned, "you really need to make sure you're doing all the right things first. So many people don't take accountability." The good news for Dinant is that the hardest part is getting the initial six pack and afterwards, it gets easier. "There's a big learning curve," Avedon said. "Granted there are people who can eat pizza and can get a six-pack. For people struggling to get a six pack, you learn to eat properly, get in a gym and be consistent. You know what you need to do. Definitely, it would be easier to maintain it and more difficult to obtain it in the beginning."